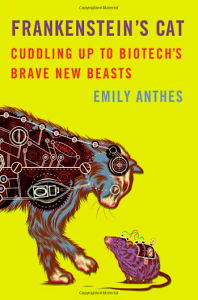 A very readable, thought-provoking, and balanced look at Halloween biotech, Frankenstein’s Cat emerged from extensive research and interviews with scientists, conservationists, ethicists, and entrepreneurs by science journalist Emily Anthes. By the way, the “Frankencat” (real name “CC,” for “Carbon Copy”) was cloned at Texas A&M from a cat named Rainbow and adopted as a house cat by veterinarian/physiologist/A&M senior scientist Duane Kraemer, founder of A&M’s Reproductive Sciences Laboratory and part of the cloning team. When she reached mating age, CC bred with “Smokey.” The Halloween biotech wedding produced four kittens, proving that reproduction was no obstacle for this clone. You’ll have to read the book to get to the punch line of the cat story. Believe me, it’s worth it. Four and a half stars on Amazon.